Free Shipping Included! Huion Battery Free Tablet H1060P 10 x 6.25 inch Graphic Drawing Tablet with Tilt Function 8192 Levels Pressure 12 Express Keys by Huion at Andy Pemberton. MPN: IPUSH1060P. Hurry! Limited time offer. Offer valid only while supplies last. Huion is a nationally supported and promoted high-tech enterprise which has the core technology and ability to research and develop independently. Huion is a nationally supported and promoted high-tech enterprise which has the core technology and ability to research and develop independently. Huion tablets are designed to inspire people's creativity with our patented pen so that you can naturally draw as you would with the real pen and paper. Active Area: 10" x 6.25" The most popular size of the Huion lines. Large and comfortable space to draw on. With this levels of pressure sensitivity, this tablet can create variations in line width and opacity. Resolution: 5080 LPI High resolution, which ensures low distortion, resulting in very smooth and accurate lines. Report Rate: 233 RPS High report rate, which makes the tablet response faster. 12 Express Keys and 16 Soft Keys. The 12 physical express-keys on the left and 16 soft keys on the top of the drawing surface are all customizable, which allow quick access to most commonly used functions. Support OS: Windows 7 or later, mac OS 10.11 or later versions. TILT FUNCTION: PLEASE CONTACT US FOR FREE UPGRADE. 8192 Levels of Pen Pressure Sensitivity allows you to create variations in line width of opacity. Resolution - 5080 Report Rate: 233 PPS. You can feel the smooth and lovely lines. Advanced Battery-free Stylus, No need to charge and no more batteries. Portable designed make it possible for long time operation, excellent or precise drawing. 12 Express Keys and 16 Soft Keys - The 12 physical express-keys and 16 soft keys are all customizable, which allow quick access to most commonly used functions. 10-by-6.25 inch drawing area. It provides more space to create or get work done. You can enjoy using huge drawing area provides for creating Art works. 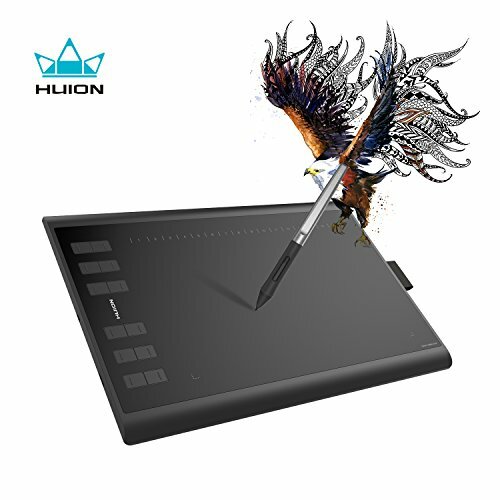 Huion art tablet is compatible with Windows 7 or later, mac OS 10.11 or later and most currently available drawing software including Adobe Photoshop, Illustrator, Corel Painter, Manga Studio, Clip Studio, Zbrush, Krita, Gimp and more. Manufacturer: Shenzhen Huion Animation Technology Ltd. Publisher: Shenzhen Huion Animation Technology Ltd. Studio: Shenzhen Huion Animation Technology Ltd.